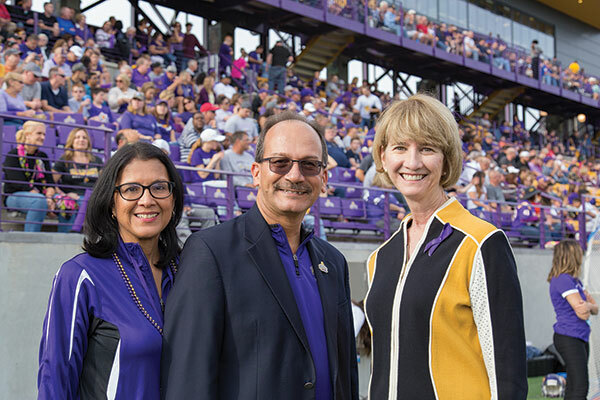 Recently, I sat down with Havidán Rodríguez, UAlbany’s 20th president, for a wide-ranging interview. 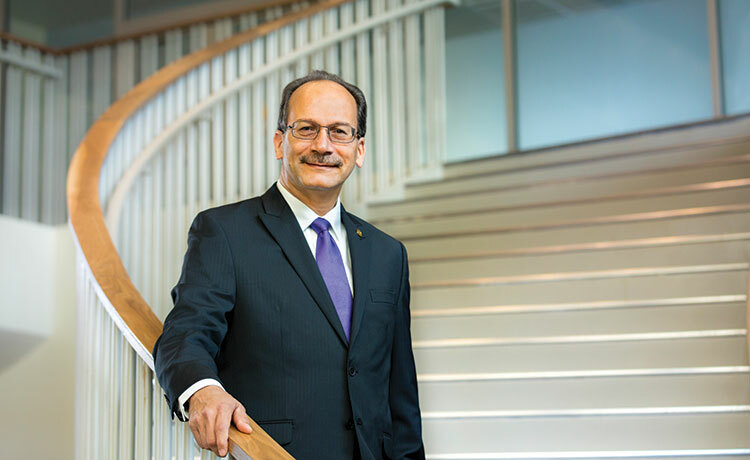 We talked about his impressions of the University after five months on the job, his goals for UAlbany’s future, and the development of the University’s Strategic Plan. Rodríguez’s desk is uncluttered, his space studiously tidy. He has a Nespresso machine behind his desk and drinks strong espresso in the morning. He has placed a few personal keepsakes – including art objects from his native Puerto Rico, framed family photographs, and awards for academic leadership – around his University Hall corner office. His bookshelves contain dozens of books, in Spanish and in English, on the topics of disasters, Puerto Rico, and leadership. Rodríguez points to two scholarly volumes published in 2018: Handbook of Disaster Research, 2nd Edition, which he co-edited, and Population, Migration, and Socioeconomic Outcomes Among Island and Mainland Puerto Ricans, which he co-authored. Focused and serious, Rodríguez has the air of an academic; he listens carefully and speaks deliberately. He insists I call him by his first name, which is pronounced ah-vee-DON. Here are my questions and the president’s responses. PG: Relocating from Texas to New York was a major move. Why did you want to become president of UAlbany? HR: I was drawn to the academic and research excellence here, as well as [to] the commitment to diversity and inclusion. During the interview process, I learned more about goals that UAlbany wanted to pursue, and I saw that they fit well with my background,and with what I could contribute to the growth and development of the institution. PG: Tell me about the Listening and Learning Tour that you have undertaken at the University. HR: I have been through all the schools and colleges and have visited a variety of units, and this process will continue into the spring. 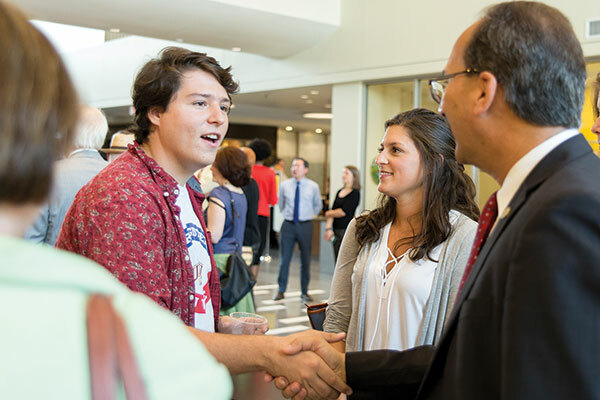 I have also been actively engaged with our alumni, elected officials, and community members to get a clearer idea of who we are as an institution, what our values are, and how the community sees us and supports us. We are at a defining moment in the history of this institution, [and] we need to stand tall and proud as we work to define our mission and vision. PG: How are you gathering input for the Strategic Plan? HR: This work started in the 2016-17 academic year, and the committee had about 17 members. After I arrived, we expanded it to about 110 individuals across the University. [The committee currently is] made up of five working groups organized around our five core priorities. PG: What are the five core priorities? HR: 1) Student Success: We need to focus on recruiting students, but also retaining them and graduating them in a timely manner so they become engaged global citizens. 2) Research Excellence: We are a Research 1 institution, and we need to continue to develop new, bold, and innovative research initiatives that also serve the needs of our community. 3) Diversity and Inclusion: We want to continue to be a model for diversity and inclusion, and ensure we have a campus climate where our diverse community feels welcomed and is welcomed. 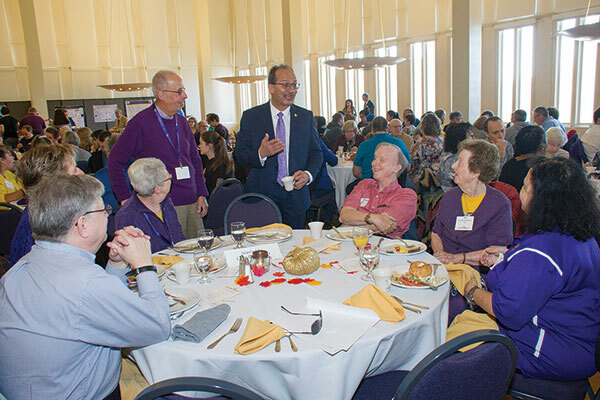 4) Internationalization: We want to build our education-abroad programs, our international partnerships, our faculty- and student-exchange programs, and our collaborative research and academic programs – to increase UAlbany’s visibility and impact across the globe. As we define our core priorities, our institutional identity and vision and mission, we are linking that to our marketing, capital-campaign and legislative priorities. As a result, we are beginning to speak a common language, which is critical to succeed as an institution. PG: What is your theory on leadership, and how will you lead UAlbany to the next level? HR: It comes down to working with excellent, committed individuals and teams. It is really about building partnerships. It is also about being trustworthy. I have always been a strong believer in leading by example. PG: You lived in The Bronx for about 10 years when you were growing up. How does it feel to be back in New York State? HR: My wife and I love New York. We have family members who still live in Brooklyn and other areas of New York. Being back in the state is very gratifying. I have met and talked with many students at UAlbany who come from The Bronx and Brooklyn, and they are incredibly proud to see that someone who spent some years in their boroughs could become president of this very prestigious institution. 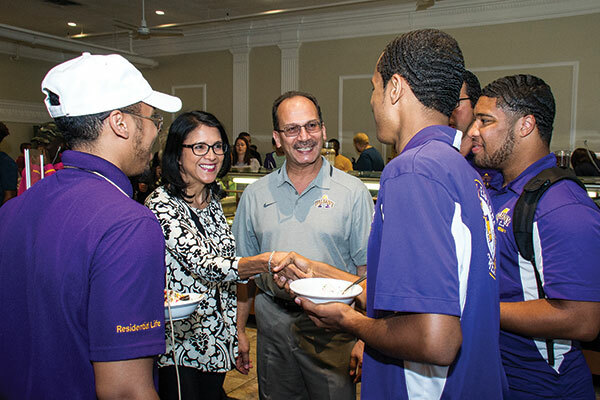 PG: As a native of Puerto Rico and the first Hispanic president of a four-year SUNY campus, how does your background resonate with UAlbany students? HR: I was raised by a single mother who made many sacrifices for me. Students see me and realize that if they work hard, are committed to their education, and continue to overcome challenges, they will be successful in their lives and careers. PG: How is your wife, Rosy Lopez, adjusting to Albany? HR: I have said from the beginning, you hired both Rosy and me. We have been married for 33 years; we have three grown children, and we are now empty-nesters. Rosy has been a strong supporter and a collaborator at all the campuses where I have served. She attends many events with me at UAlbany and is a big sports fan. In Texas, she volunteered with a food pantry and a community-garden program – she is in the process of identifying local organizations with whom she will work. So we are both adjusting very well, and we know that this is the right place for us. Paul Grondahl is the director of the New York State Writers Institute at the University at Albany.